Consistent use of the Colorado School of Mines graphic identity contributes to our image of a strong, unified school with multiple programs, services and departments that share a common mission. Please refer to the Mines Graphic Standards Guide and the Branding 101 one-page guide for information and specifications regarding graphics usage. Everything that is produced at Mines must include the logo. Administrative and academic departments should use the logo that includes the contemporary triangle plus wordmark, with or without the tagline. The horizontal, full-color version with the tagline is the preferred format; other versions can be used when there are space constraints. Use only one version of the logo per piece (with the exception of address blocks on pieces that are mailed). Leave clear space around the logo that is equal the height of the wordmark when using the horizontal logo or half the height of MINES in the stacked version of the logo. For example, if the wordmark portion of the signature/logo is 1 inch tall, allow at least one half-inch of clear space around the entire signature/logo. Be sure there is sufficient contrast between the logo and the background; all elements should be easily readable. Use high-resolution files for print applications (EPS versions). Constrain the proportions of the logo when increasing and decreasing the image size so the logo is not skewed or distorted. Use transparent PNG files when placing the logo on a background in documents, spreadsheets and presentations. Use 200 DPI graphics and photos in Outlook, Word, Excel and PPT to ensure print quality. The triangle can be used on its own only in limited applications. Email logos@mines.edu for permission prior to printing. Email logos@mines.edu with questions about logo formats and usage and for additional logo file types. Request for approval of logo use by all other administrative units should go to logos@mines.edu. Requests for approval of logo use for Blaster, the M and the Orediggers script logo should go to Tim Flynn, Associate Athletic Director for Communications, flynn@mines.edu. Use of the logos by academic units should go through the communication managers in the colleges. See the contact page for a for complete contact information. Email signature templates are also available. Typography is both a verbal and a visual communication. People see an overall graphic pattern before they begin to read content, so designers should choose fonts to fit different communications according to their messages and designs. 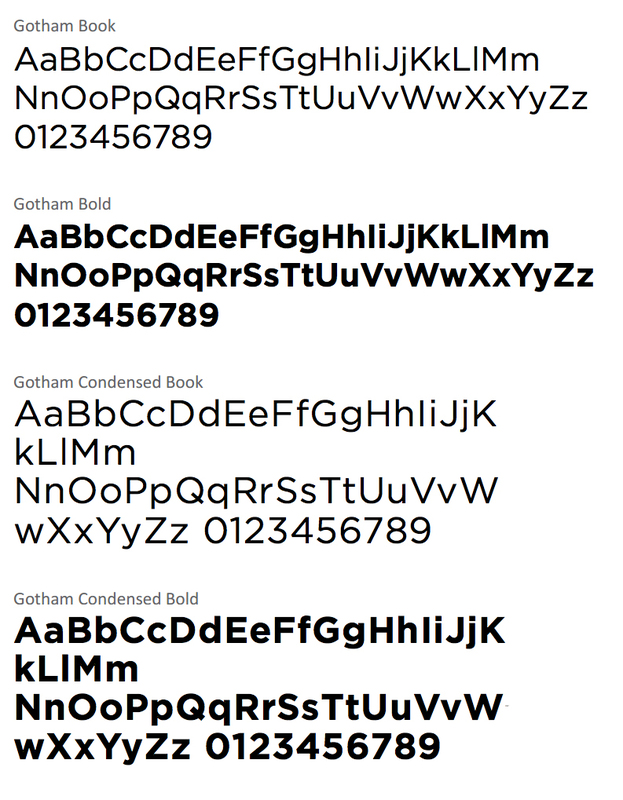 Gotham is the primary recommended font for Mines publications. Gotham Book is suggested for body copy. The simplicity of the letterforms allows the font to be easily read in large amounts of small text. Although this font is simple and clean, it has some unique elements that keep it contemporary and original. Campus communicators who frequently develop Mines materials — online or print — should purchase licenses for Gotham from Hoefler & Frere-Jones at www.typography.com. Other appropriate fonts that can be used in text documents, letters, spreadsheets, forms and email are: Arial, Calibri, Avenir Next and Century Gothic. NOTE: PMS (Pantone Matching System) refers to print industry standard colors and is used in spot color offset printing to ensure precise color matching. CMYK (cyan, magenta, yellow and black) is another print industry standard color matching system and is used in four-color offset printing. RGB is a specific reference to color for onscreen applications. HEX (hexidecimal code) is a standard code of color for web development.